We got ready Saturday morning and found a wonderful breakfast at Mr. Baldy’s, in a room painted like the interior of a bright yellow submarine—and we all lived there, lived there, lived there. Mr. Baldy’s logo is a blue moon; I had never really thought about the moon being bald, but it is. Ron took us on a driving tour of Chincoteague and we found a great playground for Zoe; she is a powerhouse of a kid and needs to be “run” from time to time. Ron and I strolled to the shore, where we saw a cross dedicated to the watermen who lost their lives at sea. Someone had piled oyster shells on the plaque as a memorial. 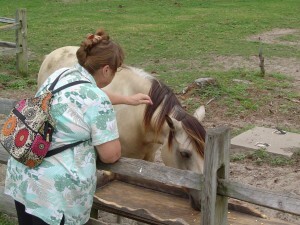 At 10, we climbed aboard a pontoon right at Snug Harbor to go over to Assateague where the wild ponies actually live. Ron had discovered that per person cost was only slightly more for a private tour than on a larger boat, so we had our pick of seats. The day was delightfully overcast, but the men sat under the bimini while the females sat right up front. We got a good view of the lighthouse and a band of ponies! I told Zoe to expect nothing, but right off we could see them with binoc’s. Cap’t John also took us past some holding tanks where watermen can store their oysters and clams until they can sell them; this means no waste to men or shellfish. We also saw where the oyster beds are being rebuilt by putting out emptied shells for the “seeds” to grow on. We saw the narrows where the ponies swim across [this Wed., July 27th in fact; 50,000 people will be there!] 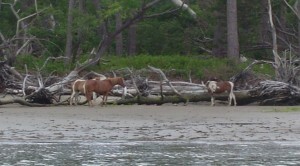 We rounded the tip of the island and discovered a score of ponies walking single file along the shore!!!!! Cap’t John said we were really lucky; he seldom sees that many, that close! I really believe the overcast sky was as pleasant to them as to us. We even saw 4 foals! Then back to harbor. We immediately drove toward Assateague, stopping at McD’s for lunch [NOT desire, expediency]. There were ponies in the lot next door, where you could give them a handful of corn for a quarter. Cute. Scratching where it itches. And yes, I washed my hands. Assateague is now a national refuge, but it has plenty of access for hiking, beach, ponies, lighthouse and a visitor center. We wanted to hike the trail to the pony overlook before the rain came in; we sprayed DEET on Ron and picaridan on the rest of us and hiked on out. We were accompanied by swarms of frantic mosquitoes. We had to re-spray frequently and fared pretty well; I think most of my bites came from wandering across a park later. 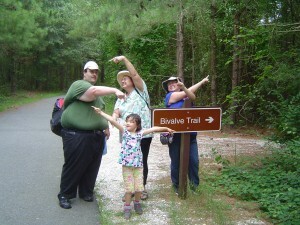 Though hot and sweaty, we were motivated to follow the loop trail. And we saw more ponies from the look-out!! On the return hike, we detoured onto Bivalve Trail—who could pass that up?—to discover a perfect, tiny beach, rich with dead but inoffensive horseshoe crab shells. Huge ones. We found a few bivalves and sugar-white sand for our museum, and returned to our car. Filthy but unbowed. 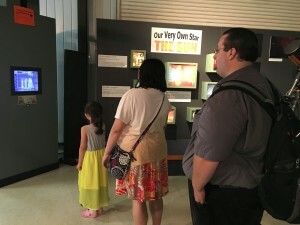 We went to the Visitor Center, where Theresa and I went in to use the facilities and to shop. We found some kid books, a shirt for Ron, a DVD about the ponies’ history-- and did as much damage in 15 minutes as we could. 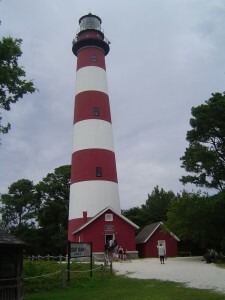 The Assateague Lighthouse was our next stop. It was too late in the afternoon for us to climb to the top and, despite Zoe’s assurance that she could do it, we thought not. It is a wonderful red and white tower on the highest point of land on the island. Maybe a 20 foot [?] mountain! Nearly perishing, we piled into the van and bee-lined for our rooms for showers and naps. Yes, hice. If it is mouse-mice, then it is house-hice. And spouse-spice. Oh, and douse-dice. But I digress. Much recovered, we went to Mr. Baldy’s for dinner, meeting a Romanian waitress. Thus fortified, we made our way back downtown for highly rated ice cream and shopping. Well, Ron and I went to the giant-chair-park with Zoe while the young Bucks went shopping. 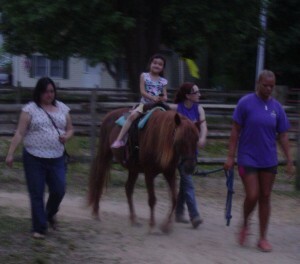 And last, but most important to Zoe, we took her to ride a pony. 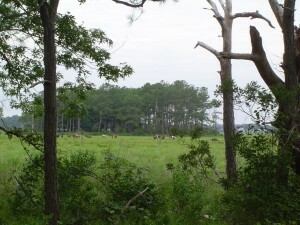 The ponies rest during the heat of the day, so it was just past sunset when we arrived at the Chincoteague pony Center. We were thrilled when it turned out that her mount was actually Misty’s great x 3 granddaughter, Desert Sun, aka Sunny. Knowing that we would have trouble getting up Sunday morning, we picked up a simple breakfast at a gas station. Then, after Zoe went to sleep, we finished off our Rifftraxx film. In a word, it was incomprehensible. I highly recommend it! We actually got going quickly the next morning and arrived at church 45 minutes early. Oops! We had the wrong time written down. So we headed back to the nice park Zoe had enjoyed Saturday [already feeling like a week ago]. The others sat in the van in phone land while Zoe and I played. I love to swing. I remember being transported to a different world while swinging. I could swing standing up, with one hand, occasionally with no hands, twisting the chains, but my favorite style was to lean over backwards and drag my hair in the dirt under the swing. I can still lean back [hair neatly in a bun, although I was tempted] but OH! the vertigo getting upright again. Zoe has learned to pump, so the whole was delightful. Then adults made us leave the park. We attended St. Andrew the Apostle Church in a large airy hall wherein more than half of the folks were visitors. The priest had a nice homily about listening to others’ needs and, at the end of mass, called all the children up for a special blessing for their vacation. He joked that they could find Pokemon, but, in fact, he gave them each a lollipop, with instructions to tell their local priest that they got candy from him. I’ll bet they all do so! We left the island reluctantly after church, but only went as far as Wallop’s Island, which is a division of NASA. I remember seeing the brightly lit contrails from rockets they had fired off there during the 1950s. I also remember thinking that’s where the phrase “it packs a wallop” came from, as in rocket blasts. But, in fact, that kind of wallop comes via the French from “gallop.” I assume [no Wikipedia on this] that this Wallop is someone’s name. We found a charming but cramped old fashioned diner for lunch [I had really fresh fried clammmmmms]. Sweet Andrew drove us home from there; he admitted he’s very much happier driving home than outward bound. I am the opposite. To me, home is where you do laundry and rest so you can plan your next trip.